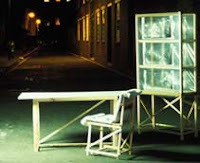 Piet Hein Eek's series of scrap wood furniture. Scruffy, rustic, and yet somehow modern in their simplicity, they're a great way to reuse all that wasted construction material piled on the street. Before Tord Boontje became the go-to guy for fairy tale-like cutouts, he came out with the 1998 Rough and Ready series, a line of furniture that was easy to make from... guess what? Scrap wood! The instructions for making the pieces yourself are on his website.